When you change your print settings in a program, the changes apply only while you are printing in that program session. 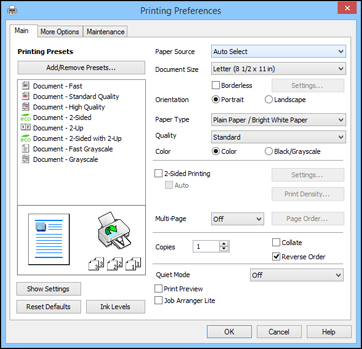 If you want to change the print settings you use in all your Windows programs, you can select new default print settings. Select the print settings you want to use as defaults in all your Windows programs. These settings are now the defaults selected for printing. You can still change them as needed for printing in any program session.